The Darkwater River is a river connecting Lake Geir to the White River. The source of the Darkwater River is Lake Geir at the western end of the Rift. It flows into Eastmarch, where it joins the White River south of Windhelm. Darkwater River, or simply the Darkwater, is a river in eastern Skyrim connecting Lake Geir to the White River. Lake Geir drains into it at the western end of the Rift. The river flows northeast into Eastmarch, cascading down the famous cliff which divides the two holds. After this series of pools and waterfalls, the river bends northwest, and merges with the White River a few miles downstream, south-southwest of Windhelm and west of the famous fetid swamps of Eastmarch. Forts, ruins, caves, and major roads line its banks. The fishing is said to be good. A large tributary flows separately from Lake Geir. 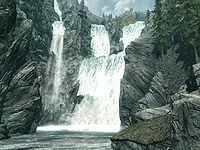 It passes north through Ivarstead, then curves northeast and creates its own series of waterfalls down the cliff, then connects with Darkwater River in Eastmarch near Fort Amol, which then merges shortly after with the White River and terminates. There is a mine that has recently been founded in Eastmarch, near the base of the waterfalls of the main river, at the bottom of the cliff. The settlement has been dubbed "Darkwater Crossing" formed on the eastern banks of the river, on the southwestern fringe of the Eastmarch bogs. The settlement may succeed in becoming a permanent and proper settlement, though it has many challenges to overcome, not the least of which being that, for most, the journey to reach it is quite hazardous and passes through unpopulated lands. This page was last modified on 7 November 2014, at 23:59.